Enamored by the fledgling game of ice hockey, Frederick Arthur Stanley – then Governor General of Canada – purchased a small trophy bowl in 1892 for ten guineas that would bear his name and become known as the Stanley Cup, with presentation originally designated to the amateur hockey champions of Canada. 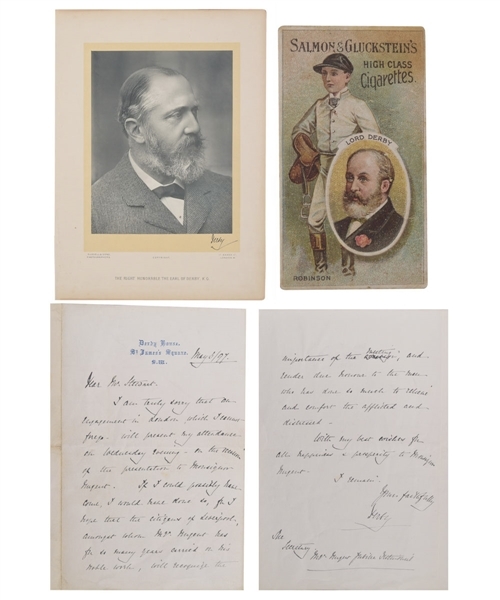 We have an important collection of Lord Stanley memorabilia, with a hand-written letter from 1897 signed “Derby”, a late-19th century cabinet photo and a rare Salmon & Gluckstein Lord Derby cigarette card from the “Owners and Jockeys” series issued in 1900. 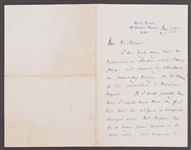 The two-page letter, penned entirely in Stanley’s hand, has been elegantly signed at the bottom “Derby” and dated “May 3/97” on Derby House, St. James Square stationery. The 7” x 9” photo is applied to a period matte measuring just over 10” x 14”, with a facsimile “Derby” signature along with “Russell & Sons photographers” and “The Right Honorable The Early of Derby, K.G.”. The single-sheet, fold-over letter measures roughly 7” x 9” (unfolded), with absolutely no issues for the signature or text, with a horizontal fold line present along with the original vertical example. A few creases and surface wrinkles are visible, with some toning over the back page, especially along each fold line. The cabinet photo features perfect clarity and remains in stunning high-grade, with just some general toning and edge wear to the matte. Lastly, the Salmon & Gluckstein Lord Derby card appears crease free, with some expected corner wear along with a small stain over the upper left reverse.